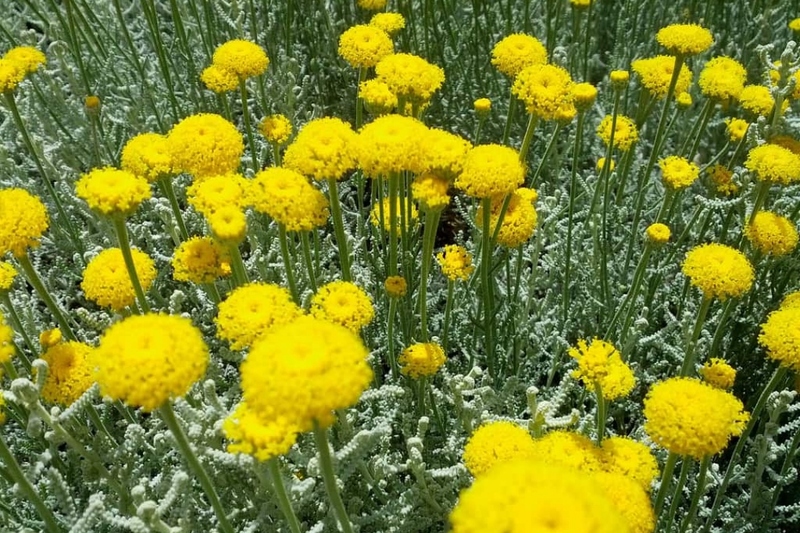 Santolina (Santolina): growing, planting, caring. A small shrub - with yellow or creamy-white flowers in the summer! Santolina is a genus of plants in the chamomile tribe within the sunflower family, primarily from the western Mediterranean region. They are small evergreen shrubs growing 10–60 cm (4–24 in) tall. The leaves are simple and minute in some species, or pinnate, finely divided in other species, often densely silvery hairy, and usually aromatic. The composite flowerheads are yellow or white. Plant santolina early in the fall to favor rooting before winter and therefore springtime health and in the spring for evergreen species. Prefer a very sunny place, hot in the summer, in very draining soil, not necessarily fertile. Plant in a hole at least twice as big as the root ball. Soak the roots before planting, this will greatly improve the chances of recovery. You can form a bowl around the plant, which will be used for watering during the first months. Tamp the soil around the roots (do not hesitate to use all the weight of the body). Water copiously until filling the planting bowl. Mulch. In pots, use a mix of loam and sand. To keep your santolina compact, prune the dried flowers in September. After several years, if your santolina is covered with old bald wood, cut all the tuft low at the end of winter. Do not water your santoline except in case of severe drought. If you find that your lavender-cotton rot, do not look for the cause in a pest. It probably lacks light or suffers from excess moisture. If you are in the cold zone - where the temperatures are sometimes around -10 ° C - your santolina may freeze. In pots, keep them in a cold greenhouse or veranda. In open soil, mulch very thick to protect the base of the plant. Do not use a mulch that keeps moisture.